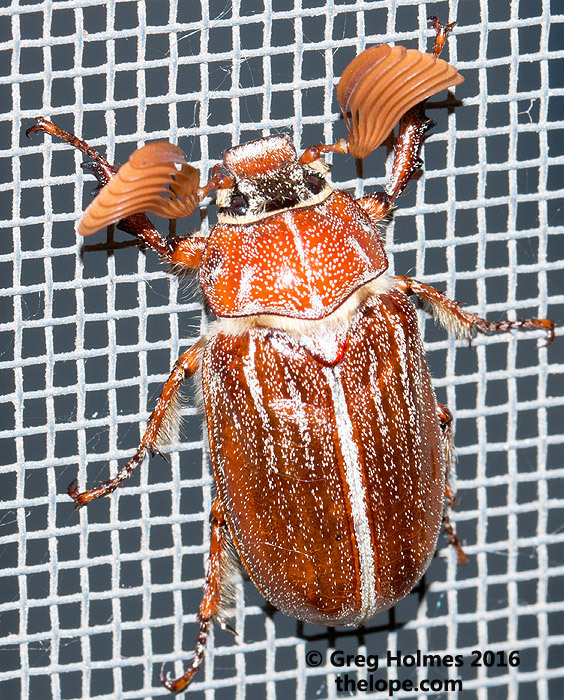 I really like the antennae on Polyphylla hammondi (Hammond's Lined June Beetle) as it graced a screen door last night in Reno County, KS. This is a good example of the utility of an articulated LCD on a camera. My Canon 70D was flattened against the screen door with a 100mm macro lens pointed down at the front of the beetle so as to be face to face with it. The camera was above my head and the LCD swiveled out and down so I could see it, with "touch shutter" in use. Normally I would not use autofocus in macro but in this case I did, using the touch shutter. The flash was just the built-in one on the camera; the lens hood was removed to avoid a shadow. ISO was 100; flash sync was 1/250, aperture was f:11 - smaller would have been better for depth of field but this was one stop underexposed as it was. A more elaborate flash setup would have been better but there wasn't time.